I know there are differences of theological opinion when it comes to discussing the Temple of God in modern or future times. There are those who are focused on the rebuilding of the physical Temple in which the Antichrist sets up "an abomination of desolation" in the Last Days. They wait with anticipation for signs that this Temple is about to be constructed, because they know the return of our Lord is near. While I do not discount the importance of this final Temple being built, I have been seeking ways to press into Him within the temple that is my human body. You see, I am fully aware of all that Scripture tells me regarding the truth that I am the Temple of God. Yet I still find there are times I struggle to enter the Holy of Holies in my spirit. I can read in 1 Corinthians 3:16, Do you not know that you are a temple of God and that the Spirit of God dwells in you? Or 2 Corinthians 6:16, For we are the temple of the living God; or 1 Peter 2:5, You also, as living stones, are being built up as a spiritual house for a holy priesthood, to offer up spiritual sacrifices acceptable to God through Jesus Christ. When God instructed Moses to build His Tabernacle, it was because He desired a place to meet with His people. His presence was with them. The Tabernacle, or Temple, included the Outer Courts, the Inner Courts, and the Holy Place (where the golden candlestick, the table of showbread and the altar of incense were place). 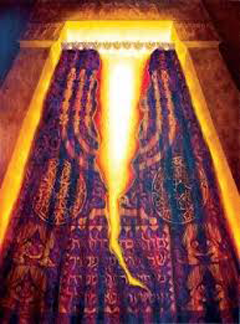 Behind the altar of incense was a thick veil that separated off a small area called the Holy of Holies. Inside the Holy of Holies was the ark of the covenant, upon which rested the mercy seat and the cherubim. God’s presence rested on the mercy seat. This is where God's attribute of Mercy was displayed. Sin is a deadly serious matter to God, because it is what separates man from God. Therefore, sin is an issue that man must acknowledge about himself and reckon with. The mercy seat represented where sins were acknowledged and forgiven. And because God is Holy, and man is unholy, the meeting place in the Temple, the Holy of Holies, was a restricted area. But that is no longer true. Because we are now the temple of the living God, we have access to the Holy of Holies in our heart because of Jesus's sacrifice on the cross. Scripture tells us that the very moment Jesus gave up His spirit, the veil [of the Holy of Holies] of the temple was torn in two from top to bottom (Matthew 27:51). Man now had access to the presence of God and was no longer separated from Him. And to make sure we understand this, Scripture confirms it in Hebrews 10:19-20, Therefore, believers, since we have confidence and full freedom to enter the Holy Place [the place where God dwells] by [means of] the blood of Jesus, by this new and living way which He initiated and opened for us through the veil [as in the Holy of Holies], that is, through His flesh. But how many of us have instituted new veils that keep us from His presence? How many of you struggle with knowing there is more to receive from your relationship with God, but you just can't get past some impediment that keeps you from the Holy of Holies in your heart? Is it something you covet in your flesh, or perhaps some sin you can't quite forgive someone [or yourself] for? How many want to see in the spirit, but there is a dirty veil that keeps you from getting that breakthrough? Or you want to hear from Him, but there is a soundproof barrier that keeps you from entering your Holy of Holies? And how many have only been able to press into the Inner Court of your heart, while others are still stuck in the Outer Courts? You don't even feel worthy to enter into the Holy presence of your God, even though you desperately long for that connection. I have a feeling that for many of us, we find ourselves navigating in and out of these Courts and the Holy Places. Why can't we enter into His presence and maintain that peace and love and power that defies description? Who doesn't want to experience communing with the Spirit of God and meeting with our Living Lord? It is a serious matter and undertaking to seek and find God in our Holy of Holies. It is a matter of pressing in, acknowledging His Holiness, and seeking Him diligently until we break through whatever new veils have been erected in our hearts. But it is worth the effort because it is a sacred place; it is our personal meeting place with God where we experience His presence and receive instruction to move from glory to glory in our redemptive journey. Praise Him for our opportunity to spend a lifetime in His presence, and then seek Him with all your heart. Press in until every shred of those human veils are eliminated and you bask in the revelation of His glory! Ephesians 2:21 We are carefully joined together in Him, becoming a holy temple for the Lord. Interesting to note that Jerusalem will have a large gay presence when the 2 witnesses come on the scene. 7 Now when they have finished their testimony, the beast that comes up from the Abyss will attack them, and overpower and kill them. 8 Their bodies will lie in the public square of the great city—which is figuratively called Sodom and Egypt—where also their Lord was crucified. 9 For three and a half days some from every people, tribe, language and nation will gaze on their bodies and refuse them burial.